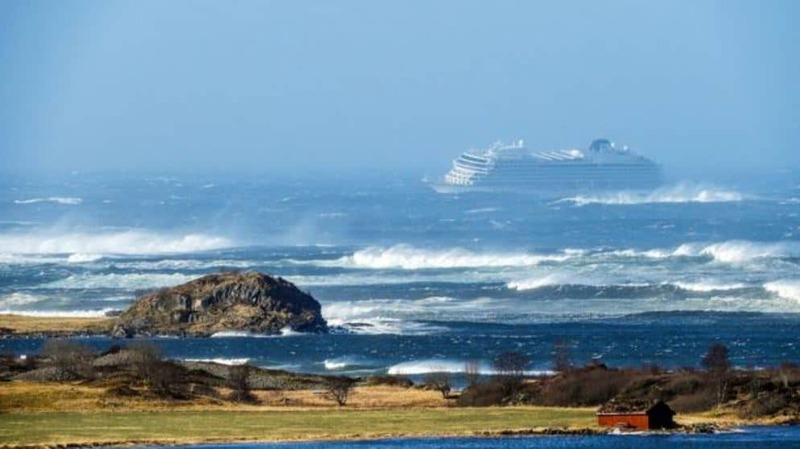 Viking Sky which is a luxury cruise ship operated by Viking Cruises has issued an urgent mayday after losing power and drifting towards the coast of Norway in bad weather conditions. UPDATE: The evacuation is going to continue through the night with around 166 so far taken to land via helicopter. Check further below for new video of the ship. Viking Sky has issued a mayday for urgent help after suffering from power loss in bad weather conditions. The luxury cruise ship with around 1,300 guests onboard at maximum capacity started drifting dangerously towards land on Norway’s west coast. The ship which is stranded just off the coast of Hustadvika, Norway issued a mayday signal and authorities have already responded. Several assets are currently evacuating all guests onboard. Helicopters are transporting everyone to safety from the vessel and a Norwegian Coast Guard ship is at the scene. According to local news, there are four helicopters in use and so far 100 guests have been evacuated. The crew has also been able to restore one engine and the ship is now anchored around 2.5 miles from the coast. Winds in the region have been reaching 38 knots causing high waves of up to 8 feet. 1645 Hustadvika: 5 helicopters and a number of vessels are involved in the evacuation of “Viking Sky”. It is working to get more than one engine running. Approximately 30 are landed (hence minor damage) and evacuation continues. An evacuation center has been set up at Brynhallen in Norway and five people have already been taken to hospital needing further attention. The Viking Ocean Cruises ship is currently on a 13-night Nothern Lights voyage which began at Bergen, Norway on March 14. At the time the vessel got stranded it was sailing towards its next port of call at Stavanger after departing Bodo on March 22. The regular call at Stavanger is not expected to take place. The luxury vessel is scheduled to arrive into London, UK on March 26. Viking Sky is 47,800 gross tons and is fairly new by only entering service in 2017. There are also around 480 crew members onboard. This comes at the same time the newest Holland America ship Nieuw Statendam was adrift this morning after suffering major power loss and engine issues. You can read all about that breaking news right here. This is developing news and we’ll keep Cruise hive readers updated once more official updates are released.